• Police have identified the shooter as Stephen Paddock, a 64-year-old man. He was earlier described as a "local resident." • Police are urging patience: "I think it's very important that you understand this investigation is going to be long and contracted before we get to the bottom of everything associated with it," Sheriff Lombardo said. • Just after 10 p.m. Sunday local time (1 a.m. 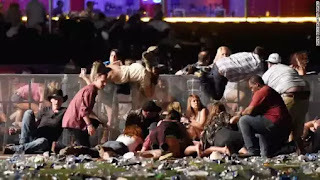 ET Monday) the Route 91 Harvest Festival -- a country music concert -- was interrupted by the sound of gunfire, witnesses said. • Performer Jason Aldean released a statement that said: "Tonight has been beyond horrific." On Instagram, Aldean said that he and his crew were safe.